To begin this huge endeavour, let's start with the game's origin. I haven't found anything as good a source of information as an interview of Sir Geoff himself, but there are at least two conflicting sources of information on the internet. A website called "Only the Best BBC Micro games" has stated that the game was originally released on the Commodore 64, while the game's Wikipedia page clearly states that The Sentinel was actually released on the BBC Micro first, and then converted for the C64 and Amstrad by Geoff himself. I have no idea which one is true, but at this point, I'm willing to believe the Wikipedia page has more credit, since Crammond actually started programming on the BBC Micro, and later moved on to other machines. So, let's presume the BBC Micro version is the original to keep things more interesting, but mostly because it would be the first game of the blog to have originated on the said machine, if it was proven true. The Sentinel is a very strange game to explain. Just calling it a first person puzzle game in a 3D environment is over-simplifying it. So let's start with what the name of the game is all about. The Sentinel is a huge totem pole kind of a thing on a high platform, watching over the landscape to see if there's anything disagreeable. It has a power to drain energy out of things it is uncomfortable with. However, it has a limited sight - it can only see what's directly in it's sight, and something in the vicinity. If you happen to cross the Sentinel's line of sight, you're in deep trouble. You are a synthoid (or a robot, as is explained in the US version), a telepathic robot, who has to climb up to every landscape's top spot and defeat the Sentinel. The landscapes are all rather surreal, having a seemingly random style of terrain with a checkered layout, but this all is part of the strategic brilliance the game exhibits. The synthoid itself cannot move around the level freely, but you will be able to look around in a robotic fashion, absorb objects such as trees and boulders (and eventually the Sentinel itself) in order to accumulate energy, which you will need to create boulders and inert Synthoid shells to which you will be able to transfer your consciousness. If you get in a really tight spot, you can try your luck by traveling in hyperspace to a random part of the landscape, although you will not be able to hyperjump to a higher space in the map - only on equal or lower height. All this sounds rather confusing, I'm aware of that. I have played this game enough to know how it basically works, but it still sounds confusing to me, mostly because it's such a unique concept that it takes some time getting used to the baffling mechanics. Now, if you have never played the Sentinel before, and want to get started with it somehow, I can give you a few pointers. The Sentinel will only come to life once you have made some noise (just turning the synthoid gently will not cause you any trouble), so you need to make good plans from the start already. Absorbing trees will give you 1 energy unit, boulders will give you 2 energy units and an empty robot shell gives you 3 energy units. Similarly, creating trees for cover, boulders to gain higher ground for new robot shells, and the robots themselves, all will cost you the aforementioned amount of energy. Also, traveling in hyperspace will cost you 3 energy units. After defeating the Sentinel at the end of each level, you will get a secret entry code to a certain level, which will be chosen based on your performance on the level you have just completed, and you can only enter a new level by entering a level number and the secret entry code in the game's title screen. I have never played far enough to come across things such as Meanies and Sentries, that I have only read about, but I know the Sentries are basically similar enemies to the Sentinel itself, only they can be located nearly anywhere. Meanies are apparently something created by Sentinels and Sentries, and can be rather nasty. It's a very strange experience at first, and might be rather off-putting because of the very primitive full 3D graphics and difficult controls. I'll tell you more about the controls later, but if you persist on it, it can be quite a rewarding experience. Unluckily, you might get stuck with the game for the rest of your days, since it has 10000 levels. Yes, ten thousand. Of course, you bloody well can't complete it in one sitting, nor are you supposed to. The game has an eight-digit number code system, that you enter in the title screen after typing in the landscape number. Still, playing the same game for 10000 levels will become monotonous and formulaic at some point, but it's a good brain teaser every now and then. Definitely more difficult to get into than, say, Tetris, but also more difficult to put down. Loading screens. Left above: C64. Left below: Amstrad CPC. Middle: BBC Micro. Right above: ZX Spectrum. Right below: BBC Micro, Superior Software re-release. The line-up for loading screens is a bit smaller than usual this time, since the 16-bit versions do not have any. BBC Micro makes up for it by having two different ones, of which the original Firebird version is clearly the better one. C64 and Amstrad share the same loading screen, but the Amstrad screen looks a bit more synthetic, probably due to the different palette. However, the Spectrum loader is probably my favourite, although I can not entirely be sure as to why. Apart from the rather uncomfortable control setup, the game plays pretty much the same on every platform, only the calculating times between turns, U-turns, transferences and hyper-jumps differ. But then again, the Sentinel's turn cycle is calculated to work with your speed of movement, so it's all just a question of comfort with the time being spent. Moving the camera works the same way on every computer - you push a directional key of choice, and the camera moves 11.25 degrees at a time, having you make 32 turns to do a full 360. The Sentinel will move 12 times per cycle, but the turn is slow enough to allow you a good amount of action. Remember, the Sentinel's line of vision is very narrow, so you will have plenty of room to dodge its devouring gaze. Because we have the advantage of DOSbox now, the game can be played as fast as you possibly could want to. Even if you had something like a real 386 MHz PC, it would still be quicker to handle than any of the 8-bit versions. But the 16-bits have a clear advantage on one point: both the Atari ST and Amiga versions make use of the mouse. Clicking on the left mouse button brings up the crosshair, and moving the mouse around just makes the playing so much more comfortable than a clunky keyboard control - you don't necessarily even need to change between the crosshair and normal modes. Only the Amiga version has a better handling for the mouse, when using it to move the camera. 3D graphics ware not such a new thing back then - even vector graphics were relatively old news. Solid, filled vector graphics, on the other hand, were new. The Sentinel was one of the first games to exhibit this next big step in 3D graphics. According to Wikipedia, due to the game's then unique first-person style of playing, The Sentinel was labelled "the first virtual reality game", which might very well be true. Of course, it's still a long way from the likes of Wolfenstein 3D and everything after that, but this was really enormous back in 1986. 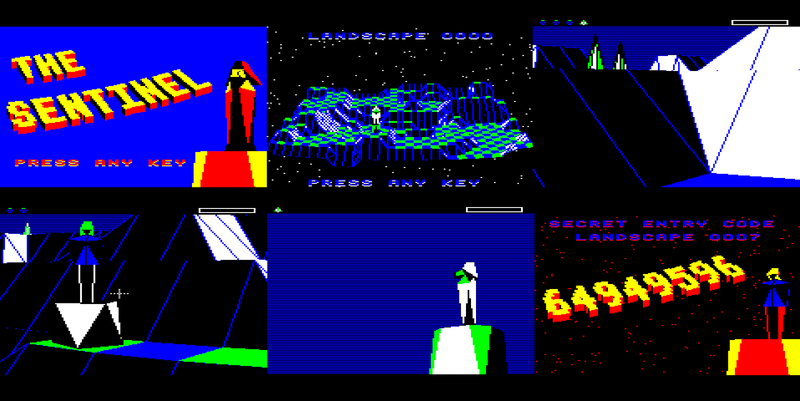 Above, you see a collection of screenshots from the BBC Micro version of the Sentinel. In order, they are: the title screen, the map screen, level 1 entry point, a picture showing a boulder and a robot shell, the Sentinel itself facing in a random direction, and finally, a "level complete" screen with the secret entry code for a new landscape. This will be the exact same composition for each machine's comparison screenshots. Since the title screen is made in a similar vector graphic style as the rest of the game, I find it a bit useless to separate them from the rest of the game screens, so I'll just make room for enough screenshot compilations to make all the systems fit. Starting with the 8-bits, most of them look very much alike. The SPECTRUM version has clearly the least amount of colours, but it has a rather interesting feature: you can change the colour scheme by scrolling through 16 choices (two of which are unusable) with the C button. All of these are made of two colours, with one of two base colours - black or blue. Of course, if you combine blue base colour with another blue, you can't see a thing. The BBC MICRO and C64 versions look very much alike, having a similar palette, only the brightness is different on the Commodore. On the AMSTRAD, though, you get a lot more colour, raising the amount from 4 to a whopping 8. Still, the playability remains the same as in the two aforementioned computers, so I have to say, it's quite an achievement. For the DOS release, you get three different graphic modes: CGA, EGA and VGA. This is possible, because the game was released as late as 1989 for the DOS. Frankly, I could not see much difference between the EGA and VGA modes, only some shading effects were a bit more pronounced in the VGA version. The CGA version, on the other hand, looks very strange - almost otherworldly, really. But that's the way it's supposed to be, so I can not say whether it's a bad thing or not. It does get more tiresome to your eyes, though, so I'm guessing it's not that good either. DOS screenshots from the VGA version. So that's the VGA version above. 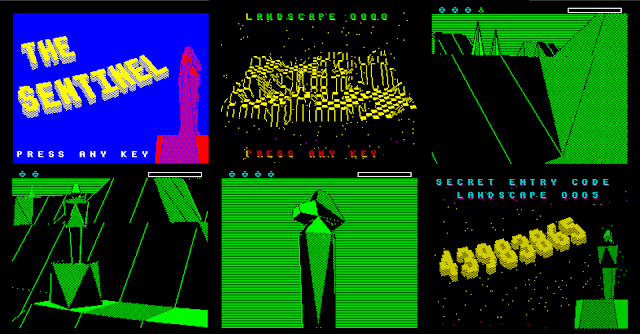 Below is a few example shots from the CGA version just to show you the difference. It's really something else. DOS screenshots from the CGA version. Both the AMIGA and ATARI ST versions look exactly like the EGA DOS version, so there's not much to say about them. I have included a screenshot of the U.S. release's title screen, so you can see whether you like the original better than "The Sentry". I know I do. 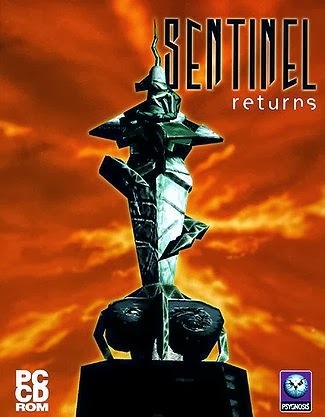 The reason for the title change for the American market was most likely another game called The Sentinel, released originally in the U.S. by Synapse a few years earlier. Commodore Amiga & Atari ST (U.S. version) screenshots. 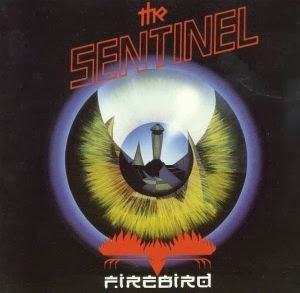 For the majority of the Sentinel's different releases, there's a really scarce soundtrack, only having the same ominous transference jingles and a similar array of sound effects: the Sentinel's creepy turning sound, creating things, absorbing things, the disturbing noise when the Sentinel drains your energy. And this works very well, it gives the game a very unnatural and horrifying overall feeling. The AMIGA version differs from the rest in a rather enormous way, by being the only version to have an in-game theme tune playing in the background. Luckily, it's actually fitting for the game, and I really recommend having a listen, if you have not done so yet. But still, if you prefer not to have background music, you can switch it off from F3. Strangely, the SPECTRUM version, while still playing sounds from the built-in beeper, manages to do the job splendidly. It's the DOS version that takes the last place here. Even though it has all the necessary sounds, the PC speaker noises are ugly and not nearly enough to get the atmosphere right. Which is pretty much the only reason people have been doing remakes for the PC. Another very interesting journey completed, at least to the extent that is necessary. The Sentinel has for long been one of my favourite concepts, if not exactly my favourite games to play, precisely because of the controls. Now that I forced myself to look through every officially released original version, it doesn't seem such a fearsome task at all, as it once used to. So I do recommend any newcomers to sacrifice a little more time than usual, if you are planning on trying out this game. I have a very clear order of preference for the versions now, but let us see what the mathematics have to say about it. Having now dealt with the list, this doesn't actually tell you how impressive each of these versions is on their respective machines. The fact is, they all are rather impressive, considering their hardware limitations, and comparing this game to other vector-3D games on the listed machines. Particularly when you consider the game has an astounding 10000 levels to play through, and the whole thing is squeezed to fit on one side of a floppy disk, or whatever it was released on. 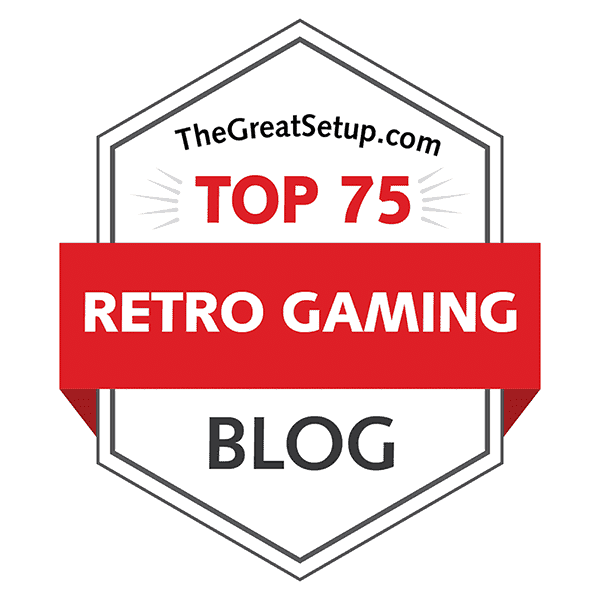 Personally, I have two favourites now: the Amstrad version from the 8-bits, and the Amiga version from the rest, but I can't honestly say the others are all that much worse. The Sentinel is just a very recommendable game to try, whatever your machine of choice happens to be. For the sake of tradition and continuity, I have to talk about Sentinel Returns for a while to close this up properly. This official sequel was developed by Hookstone, based on the design by Geoff Crammond, and released by Psygnosis in 1998. It has a slightly darker and more "hallucinated" look and feel to it, but plays quite similarly to the original, although now your movement happens in real time. This is balanced by making the Sentinel's power of absorption greater. There are only 651 single player level, but your leaps of progression are smaller than in the original. This game also has an online multiplayer mode, although I have no idea if the online mode can be played anymore. Sentinel Returns was released for the PC and PlayStation, so there is a possibility for a more modern comparison there... perhaps in a few years. That's it for now, and next time, something a bit bigger and more commercial, so stay tuned. I'd give playability 2 to the Spectrum. To which extent it is the worst? I finished the game (in about six months, phew!) and cannot honestly say, after playing the DOS version, that it is any different playability-wise from it. Yes it is monochrome - but the use of textured shadows is quite well done. 2 for graphics. So final score would be 2 + 2 + 2 = 6. Sorry Alessando, but you clearly didn't read properly what I wrote. I said it's not the worst, it's only on the same line in playability as the other 8-bit versions. There's no real difference in the 8-bits, that's why they all got only 1 point. Playability-wise, it's worse than the DOS version exactly because of calculation times between movement - again showing you didn't read the whole thing properly. But then it's just how I see it, and I'm having trouble with the graphics, sorry. You're entitled to your opinion, of course. I much preferred the 8-bit versions (particularly the c64) because it took longer to render the next frame, especially when you were being scanned by a sentinel, scared all manner of stuff out of you. the amiga version was too quick, just didn't have the same tension. Good point, and I can understand that, but I suppose that is entirely a matter of everyone's personal take on it. I always viewed it as more of a puzzle game instead of a stealth game, and it didn't have a similar effect on me. Atari Mania has the copy of the original image for the Atari ST version (US and UK versions). I don't know about the Amiga version. I know about the Atari ST version.